Actor Jeff Bridges premiered songs from his forthcoming eponymous album during an hour-plus set at the Troubadour in West Hollywood last night. Eleven-song album Jeff Bridges will be released Aug. 16. Famed music producer Quincy Jones welcomed Bridges to the stage, noting that he chose a song written by the actor, “Lost in Place,” for the soundtrack of 1969 film John and Mary. “I gave Jeff his first shot; I saw it coming,” said Jones, who referred to music as Bridges’ true calling. Bridges, backed by his four-piece band the Abiders, played “The Weary Kind” Tuesday night, along with “What a Little Bit of Love Can Do,” which serves double duty on the Crazy Heart soundtrack and as the opener for Bridges’ new album. The actor switched between acoustic and electric guitar, using the same G6122 1959 Chet Atkins Country Gentleman with BAD on the neck strap that he used in the film. Bridges wrote or co-wrote four of the album’s 11 songs. Other contributing songwriters include Burnett, John Goodwin, Greg Brown, Robert “Bo” Ramsey and the late Stephen Bruton. Guest vocalists on Jeff Bridges include Bingham, Rosanne Cash, Sam Phillips and Benji Hughes. Celebrities in the audience at the private concert included Jackson Browne, Olivia Wilde, Ryan Reynolds, and Bridges’ elder brother, Beau, who owned the first guitar Jeff ever played during childhood. A touching moment in the set came when Bridges dedicated a cover of Bob Dylan’s “The Man in Me” to his wife of 34 years, Susan. Fred Gretsch greets Jeff Bridges during a meet & greet prior to the concert. 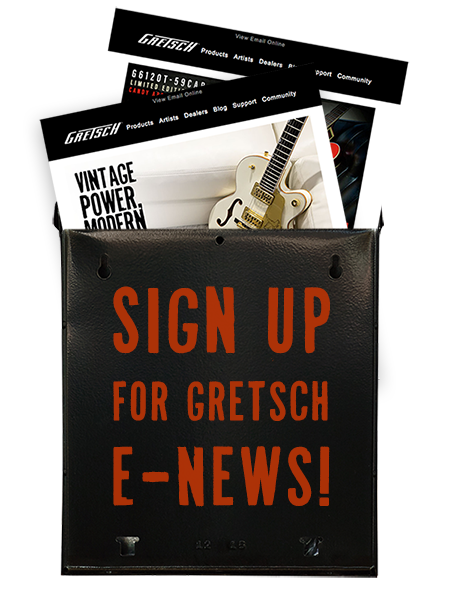 Gretsch joined Blue Note and high-end speaker company Bowers & Wilkins as the evening’s sponsors. Fred Gretsch with T-Bone Burnett. T-Bone Burnett and Quincy Jones.